I'm an embarrassingly slow driver, but I was lucky enough to be offered the chance to take part in a two-day race driving class at the Performance Driving Center at Sonoma Raceway and, while it didn't turn me into Mario Andretti, I'd like to pass on some of what I learned to any other rank but hopeful amateurs. The class I took was a special event for winners of a contest held in the Simraceway community. So, the people I was with were from all over the world — Spain, Poland, New Zealand, Narnia, California — and all were excellent at the high-end racing sim that got them out to Sonoma. Except me. I'd never actually played it, but it sure looked impressive. Some of the winners had some real track experience, and a good number had a lot of karting experience, which is how almost all real racers start. Even their computer-based racing experience proved useful for learning tracks, finding the ideal lines through turns, and helping to train your eyes and reflexes. In other ways, the simulator is useless. Nothing can replicate the physical feel of the car in a hard turn, and you can't exploit physics in the real world without some serious health-and-money related consequences. All in all, more realistic simulators like Simraceway do seem to help a little bit, at least, so if you needed another excuse to play, there you go. 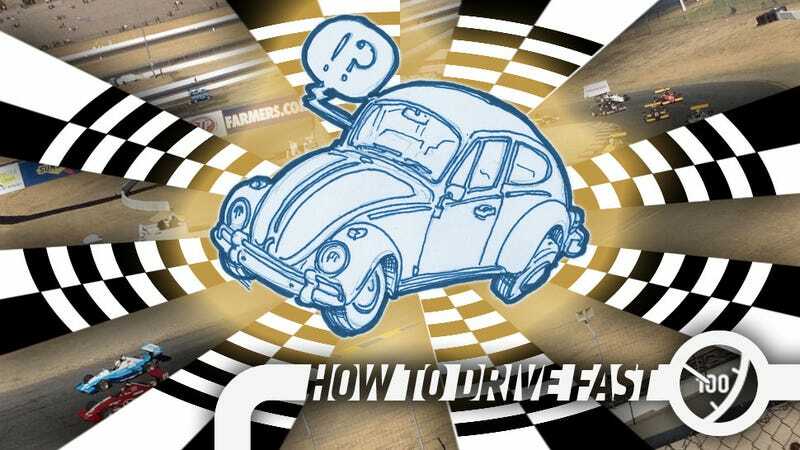 Normally, our How To Drive Fast columns are written by genuinely fast people like Alex Lloyd, but I thought there should be at least one of these that covers the subject from an unskilled perspective. And boy am I qualified to do that. Despite how incredibly well we all drive on the racetracks located inside our craniums, I suspect that I'm not alone, and there's a good number of readers interested in more competitive track driving but who just never had the time or resources to really give it a try. This is for you. For the vast number of you who know more than I do, I'm looking forward to your suggestions down there in Kinja, and the painful ache of shame in my stomach when you inevitably call me out on some woefully wrong bit of advice. So, here's the six big things I took away from racing school. I think the fact that these seem to be the ones that stuck with me must mean something, right? 1. Imagine a string tied from your steering wheel to your gas pedal. This is one of the most fundamental pieces of advice I got about driving fast, and it seems obvious once you hear it, but thinking about it while driving makes a big difference. Essentially, what this business of strings tied to gas pedals means is that you can only really go fast when your wheel is straight. If the wheel is cranked far in one direction or the other, your string will be tight on the gas pedal, and you can't push it much. When the wheel is straight, there's plenty of slack, so you can stomp that gas. Lots of gas with your wheel cranked will usually just get you in trouble. So, you let up in the turns, and bury it in the straights. As you're driving, keep imagining that string, and you'll be surprised how much easier it is to adjust your throttle to what your car is actually doing. 2. Brake hard and early. This one was a bit counter-intuitive, and goes against how most of us have been trained to drive all our driving lives. Track driving is not like street driving, and this is one of those things that drives that point home. 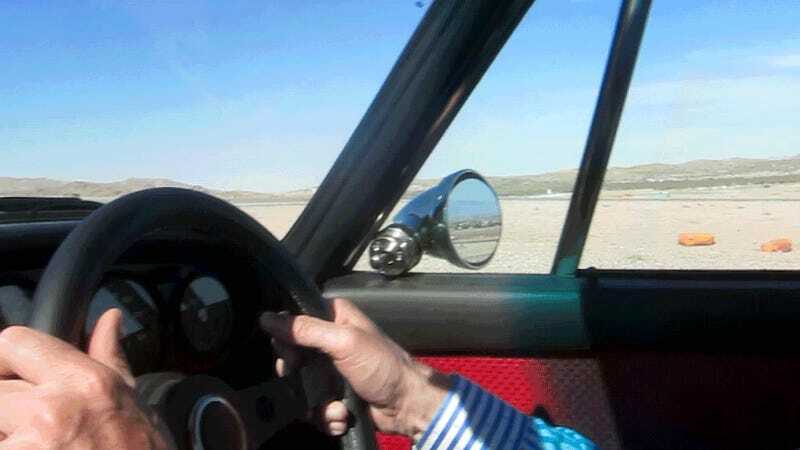 My instructor suggested that when you get to the braking point of your turn, right before your turn-in point, you need to hit the brakes hard and deliberately — with about 80%-90% of full braking force, then gradually let off the brake as you go through the turn. This does two things: first, it slows you down before you get in your turn, pretty dramatically, and second, by gradually letting off the brake it keeps the front of the car planted, since your car will tend to nose-down while braking. This is essentially trail braking, and it helps your front tires, which are doing the steering, maintain good contact with the track so the turning actually works. Slamming on the brakes hard as you approach the turn feels strange at first, since in most people's driving experience, that sort of stop equates to panic. Once you get past those feelings, it quite fun. 3. Hands at 9 and 3. Now, don't let go. Even if your arms get all twisted. In some ways, this one is the hardest to get used to, but it makes sense. Essentially, in track driving, you'll grab that wheel at 9 and 3 (not 6 and 7 like my preferred relaxed driving method) and keep those hands there. That means no letting the wheel slide through your fingers, no hand-over-hand. Your hands stay on the sides of the wheel. The reasons for this are to keep the range of how much your turning clear in your mind, and you'll never lose track of which way your wheels are pointing if your arms are mirroring their position. It also keeps you from inputing too much steering in situations where the steering isn't responding, because, invariably, if the front tires aren't able to steer you, adding more to the angle of those wheels sure isn't going to help. So, practice this one off track, because it absolutely feels strange. 4. Not all corners are important. I'm sure each of these corners mothers told them differently, but the sad truth is not all corners are created equal. One of the keys to being fast around a track is knowing how to exit a corner so you can get that wheel straight and start gaining speed again. So, in multiple-corner situations, the important one is the one that exits onto a straight. If you have to sacrifice an ideal line through one corner to enter another one well, give the one that exits into a straight the best entry, even at the expense of the one that doesn't. No one said life was fair for corners. That big window above the dashboard is quite useful, for drivers who don't insist on driving by the instruments alone. And how you look through that windshield is important as well. Generally, I was told to be always looking through the top 1/3 of the windshield. Keep your eyes on where you want to go in the distance, not right at the end of your own hood. Look where you want to drive to, and you'll drive there. This sounds much easier to do than it actually proves to be. Just try it sometime. 6. It's not like regular driving, and it feels weird at first. This is one of those things that sounds obvious, but it helps to keep it in mind when you start track driving. Even though a good racing driver is smooth, eases into and out of speed and all that, the truth is track driving does not feel like regular driving. You realize how little of your car and tires you actually use driving to and from work. On a track, everything is amplified: the speed, the noise, the inertia, the body roll, pitch, yaw, everything. You'll be tossed around and yanked and your arms will be exhausted when you're finished. Your car will slip, grip, stop and move in ways you're just not used to. And it's absolutely great, but you have to adjust to it. You have to adjust your own thresholds of what is too fast, what is too hard to yank a wheel, to hit brakes, everything. The abandon doesn't come quickly, and that's a good thing. But be ready to adapt away from where you're comfortable.